Police harm more than help victims. HYDERABAD, India, November 13, 2018 (Morning Star News) – Five families in eastern India were at a worship service last month when they received a phone call telling them to return to their homes immediately. Members of the Adivasi Ho Samaj, which in turn had come under the influence of Hindu extremists to join forces against the spread of Christianity, persuaded villagers that they must drive the five Christian families out, area resident Subod Sinku told Morning Star News. Threatened with expulsion from the village and with seizure of their farmland, three of the five families converted back to the tribal religion, Sarnaism, he said. Police advised against filing a First Information Report (FIR), telling the Christians to try to settle the matter “amicably,” he said. Sinku, 25, said that in his home village of Deoghar District, his family has warned him that he will be thrown out of his parents’ home and will not receive his share of land if he continues in his Christian faith. 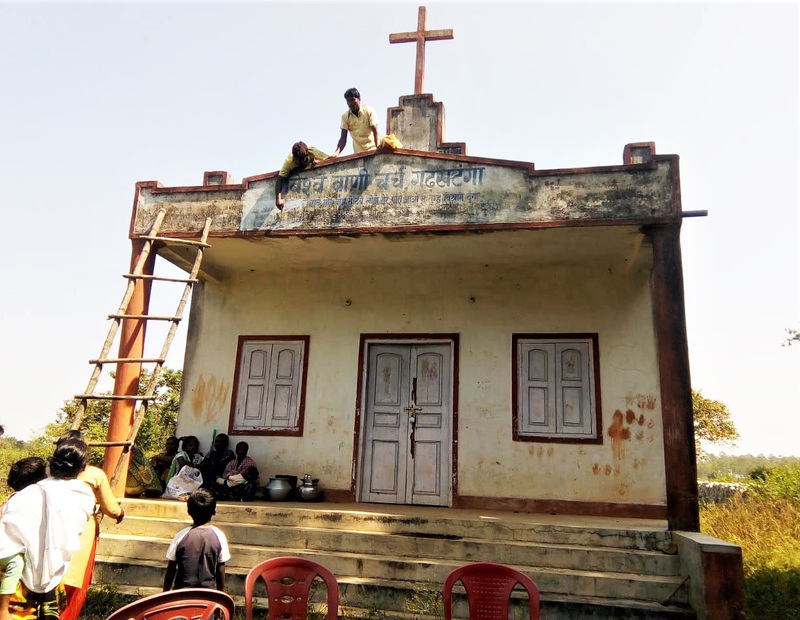 In Ranchi District on Oct. 20, Sarna members broke a lock and barged into a church building while Christians were away attending a burial service of a young female member at another site, area residents said. In the absence of anyone at the church building in Garh Khatanga, Hindu and tribal religion extremists surrounded the structure. Outside elements had instigated the villagers, who joined the extremists in breaking a cross on the building and chanting slogans against Christianity, Pastor Amandeep Bodra told Morning Star News. Church members heard about the attack but, occupied with comforting family members who had lost a child, they decided not to try to stop them and thus avoided a fight, the pastor said. The next day they reported it to police, who have taken no action, he said. “The Sarna activists had removed the cross and had set up a signboard saying, ‘Sarna Bhavan[Sarna Complex],’ and the police tell us to compromise with them,” he said. The church purchased land and constructed its building on it about six months ago, and no one objected, he said. The now 70-member church had begun meeting in 2014. The tribal animists have put their own lock on the building, which they have not been using, and they do not let the church use it, the pastor said. Church leaders told the village president that they are willing to forfeit the land and requested the official show them another plot for construction of a church building, Pastor Bodra said. They have not heard back from him and are worshipping in a congregation member’s home. In Surlu village, dozens of RSS members and tribal animists on Oct. 5 met to plan how to punish villagers for becoming Christians. The Hindu extremists and Adivasis later told the Christians that they can farm their fields, but that they cannot pass through others’ fields to get to their own, Boraiburu said. As a handful of Christians among the majority Sarna adherents, they would have risked provoking the entire Adivasi community against them by reporting them to police, he said. Earlier in Bokaro District, Hindu extremists used an elderly, bed-ridden man to give a false police statement of forcible conversion against Christians, sources said. The ordeal began when pastor Sikandar Ravidas received a phone call from a police inspector telling him to bring documents related to church construction, on the request of revenue authorities. Pastor Ravidas went to the police station near Lal Mithiya village, along with his father, Mahabir Das, and Binod Ravidas. There the inspector insisted they go with him to Chandrapura police station, said the pastor’s uncle, Manoj Ravidas. A village official who is a staunch supporter of the RSS and the Hindu extremist Bharatiya Janata Party used the elderly Mani Ravidas to give a false statement to police that Christians were involved in forced in conversions, Manoj Ravidas told Morning Star News. Eight Christians, including the pastor, Ajay Ravidas, Lakhi Devi, Hiralal Shaw, Motilal Shaw, Robert Edward, were booked on Sept. 26 under Section 298 of the Indian Penal Code (IPC) for wounding religious feelings, and under Section 4 of Jharkhand’s “Freedom of Religion Act” (anti-conversion law). Under the law, forcible conversion can be punished with up to four years of prison and a fine of 100,000 rupees (US$1,370). Ajay Ravidas was taken into custody after he tried to report Hindu extremists chasing him on motorbikes, Manoj Ravidas said. The initial judge and an additional district judge have rejected bail petitions. “We are urging the church members to be united and strong, but they are very upset that the pastor has been in jail for more than 40 days now,” he said. The coordinator of legal advocacy group Alliance Defending Freedom-India’s Jharkhand unit, Sandeep Tigga, said it is sad that lower courts refuse to take cases booked under the anti-conversion law, so the file gets passed to appellate courts, where matters remain in litigation for so long. ADF-India organizes sessions for pastors, youth leaders and Christians in Jharkhand to make them aware of their rights and provisions in the law, Tigga said. ADF undertakes legal advocacy for religious freedom in several countries. The group notes in its campaign celebrating the 70th anniversary of the U.N. Universal Declaration of Human Rights that it is sadly ironic that Christians are persecuted in India, a country with a long tradition and legal framework of freedom of religion. Article 18 of the U.N. declaration asserts that believers have the freedom to practice their faith “in teaching, practice, worship and observance,” ADF notes in its campaign to obtain signatures supporting the Geneva Statement on Human Rights at www.ImHumanRight.org.